Tags: Boreholes, Drilling, Hand Dug Wells, Handpumps, Spring Protection, Water Prospection and Investigation, and Water Quality Testing and Surveillance. Organisations: UNHCR and Université de Neuchâtel. 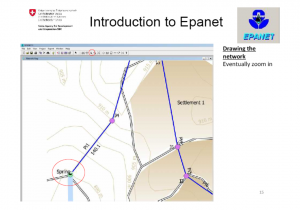 This 161 page document provides a thorough introduction to EPANET (US Environmental Protection Agency) water distribution network modelling software with a focus on designing networks for refugee settings. Tags: Piped Water Networks, Water Supply, and Water Supply. Languages: English and English. 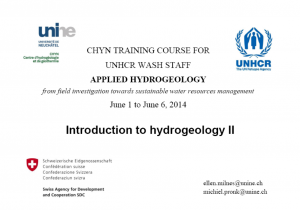 Categories: Training Materials, Training Materials, WASH Reference Documents, and WASH Reference Documents.